Cinderella and Dorothy are proof that a good shoe can change your life! And this Halloween, this amazing Witch's shoe cake stand by the Crafty Sisters will definitely change and enhance your Halloween party! Using some wood pieces, cute scrapbook paper, and a few crafting elements, this cake stand looks pretty easy and fun to make. I don't know if you can purchase these shoe pieces at a craft store or if they will need to be custom cut, but it would definitely be worth buttering up a wood working friend or making an exploratory trip to your local store. 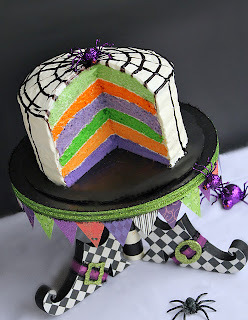 Be sure to go check out how to make this Witch's Shoe cake stand and scare up some AMAZING complements at your Halloween party. I love that cake stand! Absolutely adorable.